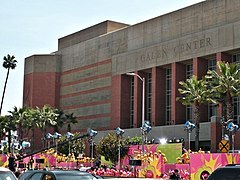 The 26th Annual Nickelodeon Kids' Choice Awards was held on March 23, 2013, at the Galen Center in Los Angeles, California. Actor Josh Duhamel hosted the ceremony. The "Orange Carpet" was set up in front of Galen Center on the sidewalks of Jefferson Boulevard. Voting on the 22 categories began on Thursday, February 14, 2013. Pitbull and Christina Aguilera – "Feel This Moment"
Kesha – "We R Who We R" / "C'Mon"
Pitbull – During the opening of the show, Pitbull and Christina Aguilera performed "Feel This Moment". Once the performance ended, Pitbull was drenched in a torrent of slime caused by Christina pushing a button. Dwight Howard – Josh Duhamel challenged Dwight Howard to a basketball dunking competition. Duhamel made one dunk and Howard made the other and told him how it was supposed to be done. After Howard's dunk, the basketball hoop rained green slime on the famed basketball star. Neil Patrick Harris and Sandra Bullock – During Neil Patrick Harris and Sandra Bullock's presentation, the two stars were covered in green slime while trying figuring out was Harris' special magic wand could do. Josh Duhamel and Nick Cannon – At the end of the show, Duhamel and Cannon took part in a special zip line stunt to reveal the winner of "Best Male Buttkicker". After Dwayne Johnson won the award, he surprised the two stars with a grand finale of green slime all over them and the audience near the stage.